"Stephen VI" redirects here. For the Moldavian ruler, see Ştefan VI Rareş. In some sources, this pope is called Stephen VII and Pope Stephen V is called Stephen VI. 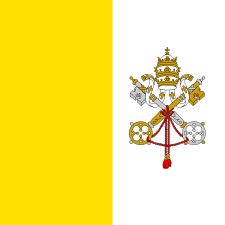 See Pope-elect Stephen for detailed explanations. 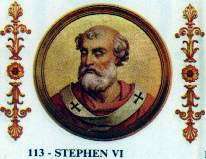 Pope Stephen VI (Latin: Stephanus VI; died August 897) was Pope from 22 May 896 to his death in 897. He had been made bishop of Anagni by Pope Formosus. 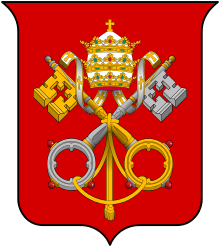 The circumstances of his election are unclear, but he was sponsored by one of the powerful Roman families, the house of Spoleto, that contested the papacy at the time. Stephen is chiefly remembered in connection with his conduct towards the remains of Pope Formosus, his penultimate predecessor. 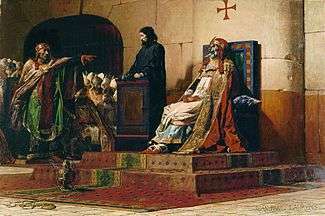 The rotting corpse of Formosus was exhumed and put on trial in the so-called Cadaver Synod (or Synodus Horrenda) in January 897. Pressure from the Spoleto contingent and Stephen's fury with his predecessor probably precipitated this extraordinary event. With the corpse propped up on a throne, a deacon was appointed to answer for the deceased pontiff. During the trial, Formosus's corpse was condemned for performing the functions of a bishop when he had been deposed and for receiving the pontificate while he was the bishop of Porto, among other revived charges that had been levelled against him in the strife during the pontificate of John VIII. The corpse was found guilty, stripped of its sacred vestments, deprived of three fingers of its right hand (the blessing fingers), clad in the garb of a layman, and quickly buried; it was then re-exhumed and thrown in the Tiber. All ordinations performed by Formosus were annulled. The trial excited a tumult. Though the instigators of the deed may actually have been Formosus' enemies of the House of Spoleto (notably Guy IV of Spoleto), who had recovered their authority in Rome at the beginning of 897 by renouncing their broader claims in central Italy, the scandal ended in Stephen's imprisonment and his death by strangling that summer. This article incorporates text from a publication now in the public domain: Herbermann, Charles, ed. (1913). 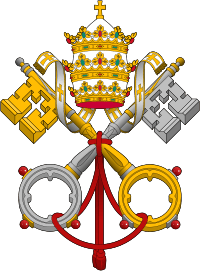 "Pope Stephen (VI) VII". Catholic Encyclopedia. New York: Robert Appleton. 1 2 The Editors of Encyclopædia Britannica. "Stephen VI (or VII)". Encyclopædia Britannica. Retrieved 30 August 2016. ↑ Cummings, Joseph: "History's Great Untold Stories", page 14. National Geographic, 2006.